Spraying a broad-spectrum herbicide like Roundup is one way to control weeds in your flower beds or yard quickly and efficiently. But like any herbicide, Roundup contains chemicals that warrant appropriate safety precautions before, during and after use. The main ingredient in Roundup, glyphosate, kills plant life by disrupting the shikimic acid pathway, thus preventing the plants from making necessary proteins. Without these proteins, the plants quickly die. 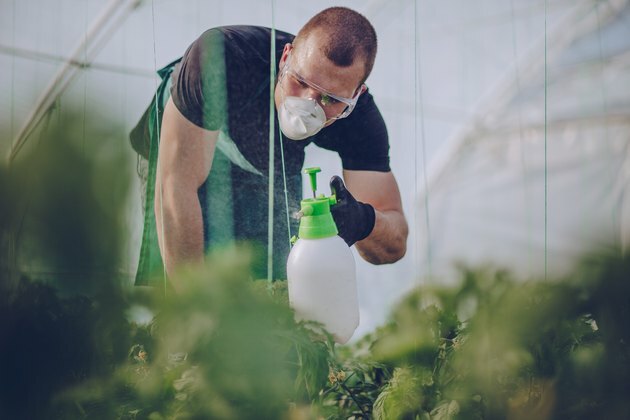 Unlike some herbicidal chemicals, glyphosate attacks both grass and broad-leaf plants, making it a popular product for general use and for clearing large patches of plant life. Glyphosate does not represent a major safety concern for humans in low doses, according to the U.S. Environmental Protection Agency. However, Roundup contains other ingredients that act as carriers to help glyphosate stick to plant leaves and enter the plant cells easily. Known as carriers, these other chemicals can be irritating to your skin and respiratory and digestive systems even at low doses. Always read the label of the specific Roundup or herbicidal product that you use in order to follow all of the recommended precautions. Roundup products containing glyphosate caution users of the potential for moderate eye irritation. Avoid direct contact with your eyes by wearing eye protection when spraying Roundup. Also, avoid getting Roundup on skin or clothing as this makes it easy for you to wipe it into your eyes accidentally. Wear protective gloves and wash your hands thoroughly after use to remove any traces of Roundup weed killer on your hands. If you do get Roundup in your eye, hold your eye open under a gentle stream of running water for approximately 15 to 20 minutes. Take out contacts if you wear them, and call poison control or your doctor for further instructions. Breathing Roundup fumes can also be irritating. Try to spray Roundup on a calm day with little to no wind. Take advantage of the spray wand to spray this herbicide close to its intended target while you remain standing upright. 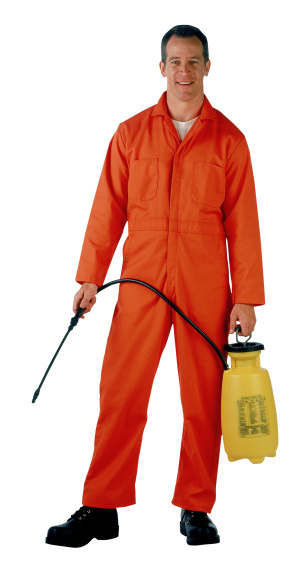 This will increase the distance between you and the spray, thus reducing the chances of you breathing Roundup fumes. The Roundup label also recommends keeping children and pets away from any sprayed area until the area has dried. This can take up to 12 hours. Glyphosate binds to soil and is unlikely to enter the groundwater system, according to the EPA. However, the likelihood of glyphosate and other Roundup chemicals entering water runoff increases when it is applied 24 hours before rainfall or strong winds. Plan to use Roundup according to the forecast, and take care not to pour or apply Roundup in an area where it will wash directly into storm drains or gutters.